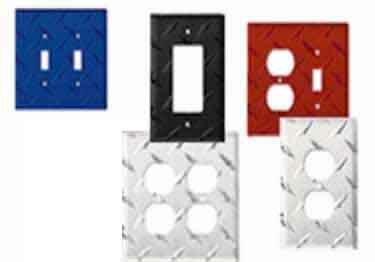 Metal Wall Plate Covers crafted from real commercial grade Aluminum Diamond Plate. Choose from an assortment of switch and outlet configurations. Our Wall Plate Covers are manufactured to standard wall plate dimensions measuring 4-1/2" high or 5" high with standard 2-3/8" mounting to fit all USA and Canadian receptacles.